Not too long ago, Barnes & Noble was a big bad bully of the bookselling industry, pushing indie bookshops out of business across the country and swallowing up competitors like B.Dalton. For a while it jousted for top dog status with Borders, its main competitor in the superstore category. But then along came Amazon, the biggest, baddest book selling behemoth of them all, armed with easy online click & ship ordering, the Kindle e-reader, and marketing savvy. Borders would go into a slow death spiral, finally crashing a few years ago. 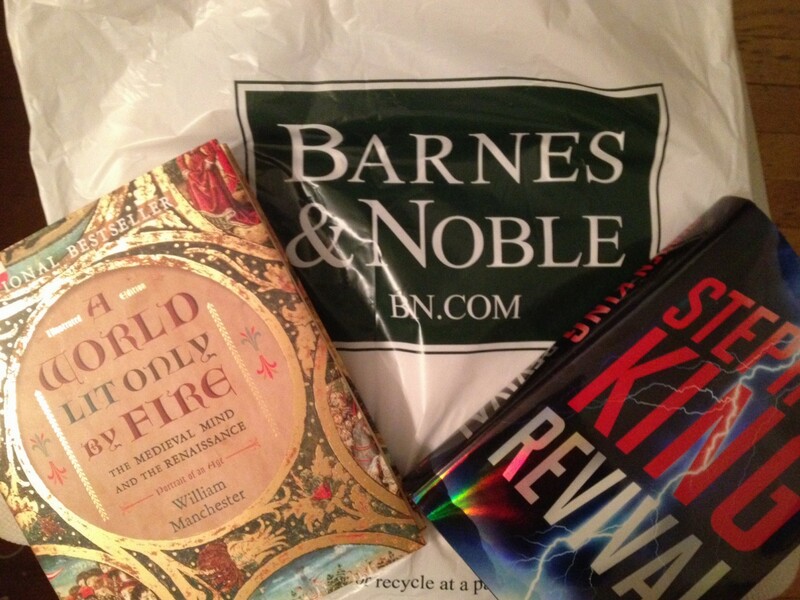 Barnes & Noble is now trying to survive as the only significant, national brick & mortar bookstore chain. The top dog has morphed into the underdog. Still and all, I very much hope that B&N makes it. I have always enjoyed walking into their stores, wondering what new discoveries await me, and exploring their huge selections. In addition to the shopping experience, B&N’s stores host author talks, meetings of writers’ circles and book clubs, and informal meet-ups. They are good for a community. In addition to shopping at indie bookstores and, yes, Amazon at times, I’ve been making a conscious effort to buy more of my books, DVDs, and periodicals at B&N’s main store here in Boston. If it disappears, Boston will be without a major, high volume bookstore in the heart of the city, and that would be a genuine civic shame. Barnes & Noble and I go way back. I first discovered it well before its superstore era, when the company was a plucky retailer, with stores in Manhattan and a fledgling mail-order business. As an undergraduate living in Indiana (1977-81), I sent away for their thick catalogs, and I would spend hours poring over the remainder listings in search of good bargains. When I moved to New York for law school in 1982, my periodic walks from NYU’s Greenwich Village campus up to B&N’s twin retail stores on opposite sides of 5th Avenue at 18th Street became regular rituals. The east side location housed its flagship academic bookstore, offering mostly new non-fiction titles and textbooks at full sticker price. As a budget-conscious student, this made it better for browsing than for buying. The west side storefront, however, was the site of B&N’s huge Sale Annex. It quickly became a personal treasure trove, with several floors of low-priced remainder books, discounted new books, and a generous used book section. At the risk of betraying more of my geekdom, I confess that my heart would start beating faster upon entering the store, in anticipation of the affordable goodies I might find there. I cannot guess how many hours I spent in that store during my 12 years in New York. Right next to the Sale Annex was a large B&N music store. Here, too, I was overwhelmed by the choices. This was still the golden age for cassette tapes, and the music store seemed to have them all. At the time, my “stereo system” was the portable cassette player I had brought with me from Indiana, and I would wear out the batteries over and again playing my purchases there. In the early 1990s, B&N made its big move, launching the superstores with their huge book selections, many shelves of periodicals, music and video offerings, and cafés selling beverages and food. They started in New York and soon expanded the concept nationally. At that point, B&N became the bad guy, the Manhattan bully that was pushing small independent bookshops out of business. There was truth in the charges. With its thousands of titles and discounted best sellers, B&N simply offered much more than did its smaller competitors, and at lower prices for popular books. Borders would soon join the fray, and the two went head-to-head for a decade or so, while the indies took even more of a beating. Among book lovers, the superstore vs. indie issue became political. Looking back, I recall being in a distinct minority among my liberalish social cohort in saying that I preferred the big superstores to the mom & pop bookshops. My gosh, the superstore vs. indie discussion is largely passé, yes?! When it comes to bookselling today, it’s Amazon vs. Everyone Else. In fact, until recently it appeared that Barnes & Noble would go the way of Borders and disappear from the scene. In particular, B&N’s Nook e-reader has flopped as a competitor to Amazon’s Kindle, and losses from its e-book division have been a drag on B&N’s balance sheet. In addition, Amazon’s ubiquitous online presence has hastened the closure of many B&N stores across the country. Among the departed are the main and annex stores on 5th Avenue at 18th Street. That breaks my nostalgic heart a little. However, B&N has been making something of a comeback. It appears that a growing number of book buyers have recognized the importance of having brick & mortar bookstores around, and B&N has joined indie booksellers in enjoying a minor resurgence. In pure business terms, even its stock value has staged a recovery. In the meantime, I’ve rekindled my enjoyment of visiting brick & mortar bookstores of all types, including small indies, used bookstores, and B&N’s superstores. Yup, click & ship is awfully handy, and online booksellers (including B&N and Amazon) are now networked with used bookstores across the country, making the hunt for elusive out-of-print titles much easier. Nevertheless, physical bookstores, where you can browse and discover and buy, are a joy for the mind and spirit and are part of an intelligent, healthy society. Let’s hope that B&N and other bookstores are around for a long time. I look forward to giving them more of my business. David, I don’t want to see any more bookstores disappear either. But I have noticed that the B&N in my area (over the border in Washington State) is giving more and more floor space to non-book items (cards, candles, journals, etc.). The same thing is happening at the Indigo/Chapters chain in Canada, and I know that at Indigo/Chapters that change has reduced the shelf space available to books from independent publishers and books that aren’t perceived to be potential big sellers. I would like to patronize bookstores that actually sell books, and books that aren’t just the John Grisham/James Patterson blockbusters. Unfortunately I see B&N moving away from that model. Fiona, I agree, I think B&N stores have way too much of that ancillary stuff, and they devote a lot of floor space to it. I think they need to get back to their roots, which is to promote and sell books. The question of how much space to devote to books by small presses, lesser known authors, gets complicated for large and small bookstores alike. Perhaps each B&N store could devote x percentage of space to a curated, highlighted selection of small press and local author titles. I believe that some do so. However, I think the Internet is the better place to sell titles that fall into the niche category. Here’s where online discoveries do bring me the delight that I experience when finding some new at a brick & mortar store!